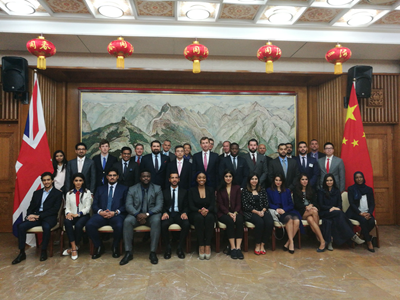 On September 12, Minister Zhu Qin was invited to give a lecture at the Embassy on China's international status and influence to the participants of the Future Global Leaders' Programme sponsored by Standard Chartered Bank. Present at the lecture were Patel, Vice President of Customer Clients in Standard Chartered Bank, and some 50 young business leaders and royal family members from over ten countries including India, Indonesia, Turkey, Saudi Arabia, UAE, Nigeria and Kenya. In the context of the current development in China and the international and regional situation, Minister Zhu gave a presentation on China's foreign policy in detail. He pointed out that, China is a defender of world peace and stability, a facilitator for mutually beneficial cooperation, an advocate for mutual learning among civilisations, and a practitioner of international governance. China's development not only benefits more than 1.3 billion Chinese people but also provides the international community with more public products that benefit the world. China is a source of positive energy to world peace and development and the construction of a community of common destiny. 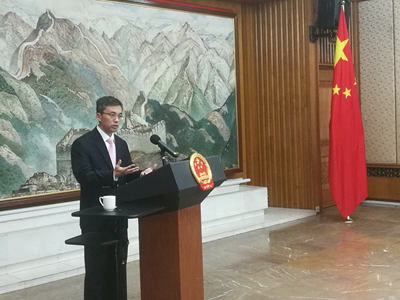 Minister Zhu also highlighted the building of the Belt and Road Initiative and the BRICS Summit in Xiamen and answered questions on the North Korea nuclear issue, China-India relations, wildlife protection and the upgrading of industrial structures in China. The participants of the Programme found the lecture helpful in enhancing their understanding of China's national conditions and China's contribution to the world. They will follow China's development more closely and they expressed the hope that China will enjoy faster development and make greater contribution to world stability and prosperity.